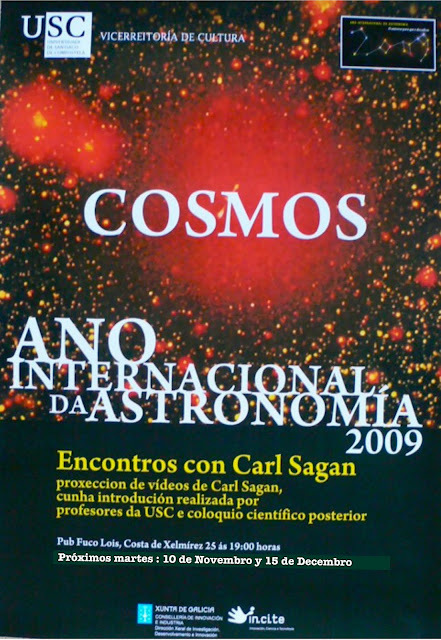 I was due to post an advert for a monthly event here in Santiago, part of the International Year of Astronomy, which has been going on for a few months and is due to continue into next year. Every month in Pub Fuco Lois the landlord has cleared the way for a showing of an episode of Carl Sagan's Cosmos. I attended the last event which was extremely enjoyable, though not as well attended as I'd hoped. After watching the episode (dubbed into Spanish) people chatted over drinks about the show before dispersing into the night. A fun evening but it will be improved by the inclusion of more people. So, come along next Tuesday and enjoy the show! The coincidence of course is that today is Carl Sagan day and would have been his 75th birthday. For some words from a true Sagan oficionado go and see what TMT has to say on the subject and watch the videos linked therein. Every cafe and bistro and pub should run COSMOS this time of year! It's not just a good idea- it should be the law!